I am pleased to say that some of my posts became useful to others particularly to my sister, Susan Papas Hauck. It provided links to other seekers who are in their journey to a path beyond comprehension. Unbeknownst to me, maybe this is the main reason that made me start to write. Yesterday, Susan celebrated the 20th year of life, love, faith, and devotion to The Miraculous Infant Jesus of Prague. We had a grand celebration. In preparation, she put together a pamphlet of stories and testimonies. Devotees shared their miraculous experiences and conversions. It was a group effort from families and friends. When one does missionary work, you will never know where it will lead you as Susan told us a story about her next calling. Greetings of love, peace, and joy. This event is to honour and to say thank you to the Child Jesus on His blessings to us all. His arrival here on Sept 7, 1998, is when the mission started in Vancouver. Not knowing what to do, with the guidance of the Holy Spirit and our Mother Mary, Larry and I went to Fatima on the last week of April 2016 to celebrate the 100th year apparition of our Lady of Fatima to the 3 children. We were at the apparition chapel situated at the big rotunda where the procession started in the evening. At the chapel stands a statue of Our Lady of Fatima. I stood close to her, and her beautiful face looked so radiant as if there was a glow on her. Fr. Walter Munna from Uganda is in Rome for 4 years studying and doing His thesis. We are in touch for this mission to bring our Little King to Uganda. We have now a statue blessed and consecrated in Prague with a recognition letter. 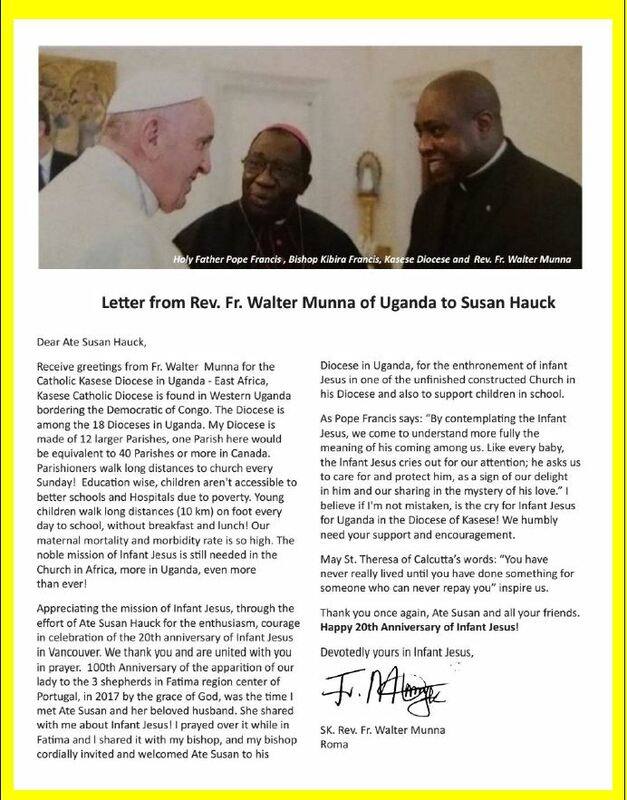 We need your prayers and support for this mission, in the hope that we can help the children of Uganda and the love of Infant Jesus be spread throughout the world. May Infant Jesus bless, guide and protect us all. A letter from Fr. Walter Munna of Uganda. Much to my surprise, Susan included posts from The Power of Tiny and copy of a handwritten note of my mother as well in her pamphlet as her note to me. I would like to write about my sister, Maria Perpetua. Her nickname and as we call her, Lady. I knew for some time that she does writing in a blog anything that interests her. Sometimes, she uses her family as fodder for her readers. She shared some of her published writings about me. I remember she asked me where Larry and I want to go on a trip other than my Infant Jesus missionary work. I told her of my desire to visit where Baby Jesus was born, Bethlehem, Not knowing, she arranged a pilgrimage trip for us to Holy Land, all paid for, with a group of pilgrims from Toronto. Why did she do this? She said, being grateful for her arrival here in Canada 42 years ago. Larry and I sponsored my Mother to come to Canada. The rule then was that any children that are still dependent on Mother must move to Canada with her. Happy to say that six of my siblings came along, including Lady. I thank you, Lady, for your unconditional love. It was a wonderful celebration to increase faith and raise awareness of Susan’s travel to Uganda for the Installation of Infant Jesus of Prague next year, 2019, and raise funds to support the Ugandan children in school. One of Susan’s dream is to build a shrine in Greater Vancouver. For now, it hasn’t materialized. What is essential that the church of Infant Jesus is in our heart. This entry was posted in Story and tagged Dream, Faith, Infant Jesus of Prague, inspiration, Kahlil Gibran, Missionary, On Giving, Quote, Spirituality, Sunday Snippet, Susan Papas Hauck, Uganda by Perpetua. Bookmark the permalink. A moving story. Thank you for sharing it. Randall, thank you for reading. Please do and take the opportunity while you are in Prague. If you need to speak to the authorities of the Church to gather info for your photography, I can connect you to my sister, Susan, Fall is a lovely time. Take care.